We use precious resources efficiently, so as to live in harmony with the global environment. With the aim of maintaining good relations with the community and living in harmony with the global environment, Godo Steel specializes in recycling steel and promotes various environmental activities. 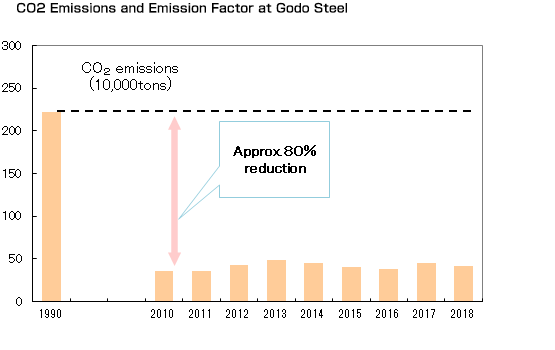 Notably, Godo Steel has installed various environmental protection systems, including dust emission prevention equipment, water pollution prevention equipment and air pollution control equipment. In an effort to create “green plants” that are welcomed by local residents, and thereby sustain a harmonious relationship with the global environment and local communities, we are planting as many trees as possible in open spaces inside the plant's property line. Since the Himeji Works obtained the international standard of the environmental management system "ISO 14001" on April 11, 2002, all our works including the Himeji and Funabashi Works have acquired and continue to maintain it. We have already updated "ISO 9001" in 2015 version for all our works and have established a system to continuously promote the quality and environmental initiatives in addition to the acquisition of "ISO 14001". Godo Steel has replaced its steel making processes with new processes that do not require a blast furnace, and has changed the fuel from petroleum to natural gas. We have succeeded in considerable reduction of total annual emissions by more than 80% compared with 1990. Since then, we have been steadily maintaining it at low level by taking aggressive measures such as energy conversion and direct delivery of slabs. * We comply with the following guidelines and principles for managing properly our iron and steel slag products. * Regarding the status of compliance with the above guidelines and principles, we receive third-party screening every year and are highly evaluated. For more information on those guidelines, please see the website of the Nippon Slag Association. Certification body: JIC Quality Assurance Ltd.